A few years back I discovered Woot, which I thought was a pretty freakin’ awesome site for getting neat stuff cheap. 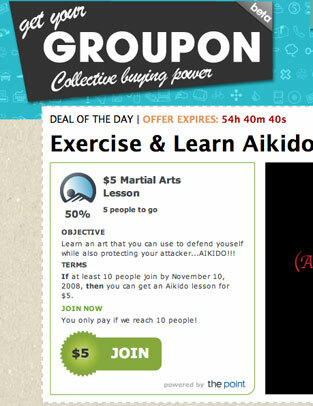 Now there are deal sites at every turn, but Groupon has taken this idea and localized it. Groupon takes discounting to the Web a la warehouse stores by using collective buying power. Each day, they present a Deal of the Day; if enough users sign up, the deal is “on,” meaning you can take advantage of the deal. Basically, it’s a great way to get a deal and it takes the power of the social Web to a whole different level.